The second recipe of my apple challenge was a success. 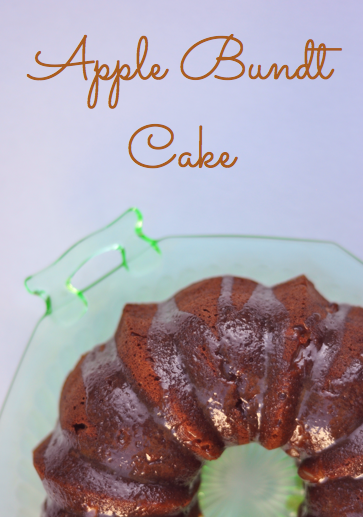 It was moist and deliciously spiced with very gooey chunks of apples interspersed throughout. I decided to make it a bundt style because it seemed fitting. There was a second challenge I faced with making this a bundt cake. In my previous experiences with bundts (not including chocolate versions) the outer layer of the cakes ends up way too crispy and browned. And when it comes to a pound or a lemon cake that can be extremely frustrating. I researched why this was happening and my conclusion was that a non-stick pan (most bundts are non-stick) tends to cook faster, so the oven temperature should be lowered by 25º. Moreover, you should know the real temperature of your oven by hanging an oven thermometer in your oven. I found that mine was already working 25º higher than the set temperature, so I had to lower mine a whole 50º. The outcome was so much better. The outer crust of the cake was moist and definitely not overcooked. I used this recipe, and made some slight alterations. • In a medium mixing bowl combine the eggs, oil, and apple sauce. Beat until foamy. Add the sugar and vanilla and stir to combine. Add the dry ingredients and stir just until wet all the way through. • Fold in the apples. Put batter into greased bundt pan and bake in an oven preheated to 325º. I baked the bundt for around 40 minutes. • When cake is done, invert on to a serving platter and let cool slightly. While cake is cooking, make your glaze. • For the glaze- in a medium sauce pan combine all 3 ingredients and bring to a boil over medium heat. Boil for 3 minutes. Pour over warm cake.